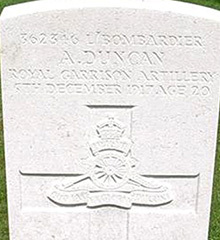 Andrew Duncan was a son of Andrew and Margaret Duncan. He was born on 18th June 1897. His father was a grocer in Drumquin, Castlederg. Andrew was working and living in Liverpool where he enlisted, joining the Lancashire and Cheshire Regiment. Lance Bombardier Andrew Duncan was serving with the 393rd Siege Battery in the Royal Garrison Artillery when he was killed in action at Ypres on Wednesday 5th December 1917. Bedford House Cemetery is located 2.5 Km south of Ieper town centre. The cemetery lies on the Rijselseweg (N336), the road connecting Ieper to Armentieres. From Ieper town centre the Rijselsestraat runs from the market square, through the Lille Gate (Rijselpoort) and directly over the crossroads with the Ieper ring road. The road name then changes to the Rijselseweg. The cemetery itself is located 2 Km after this crossroads on the left hand side of the Rijselseweg.